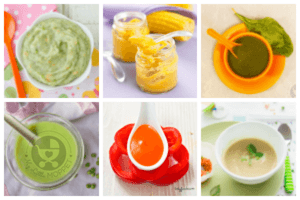 Ready to prepare your baby’s first food? 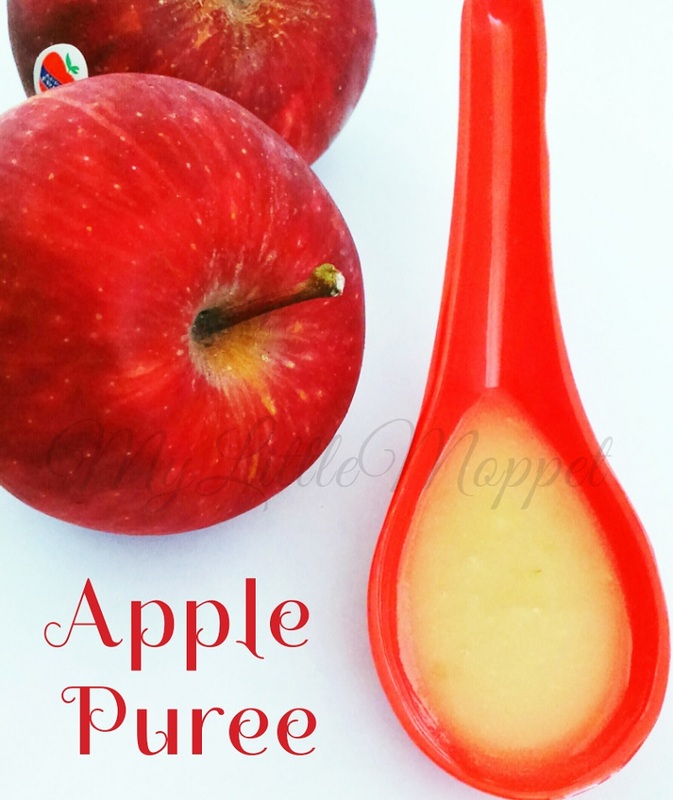 Apple puree for baby is an easy to make and yummy first food. 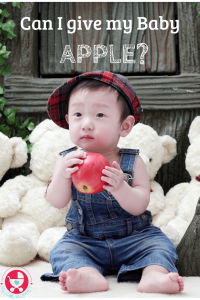 Apples are rich in dietary fiber and are least allergenic and make the perfect first food for babies. 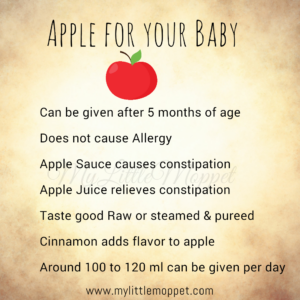 The most popular choice for the baby’s first food is an Apple puree because, they are easily digestible, sweet and unlikely to cause allergies. So they can be started in the 5th Month. Sterilize all the utensils and equipment either using a Sterilizer or boil the utensils in hot water. 1. Select a juicy red apple. Wash it with water. 2. Peel the skin, de-core the apple and remove the seeds. 3. Cut the required quantity of the apple. You can steam the apples using Steamer (steaming helps in preserving most of the nutrients). Take the apple chunks in a bowl, place inside a pressure cooker filled with water, cook them for 4 to 5 whistles (it depends on the type of apple), after the steam is out, remove the bowl. Take a thick bottomed pan, fill with water, place the bowl with apple, cover and cook till the required consistency is achieved. 5. After cooking the apple either you can mash the cooked apple by spoon or masher or blend it with Blender . Do not add water, add breast milk or formula feed to make it little runny. 6. Transfer the contents to a sterile feeding bowl and serve. 7. Do not forget to follow the 3 Day Rule for introducing any new food. Why can you give apple juice for constipation but not apple sauce/puree? 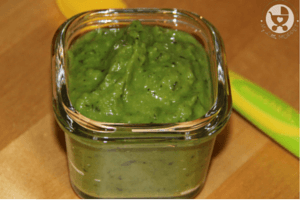 Apple sauce/puree is of the whole fruit and so contains more pectin which may cause the stools to harden and leads to constipation. Apple juice contains more sugars and liquids so it may relieve constipation as it has a laxative effect. Apples are good sources of dietary fiber and Vitamin C. Dietary fiber helps in prevention of constipation. Energy – 52 kilocalories per 100gm. If you like this article, Subscribe to our Newsletter here for free to receive regular updates. We Promise not to spam your inbox!! Can be given after 5 months Tastes good raw or steamed and pureed Apple sauce/puree causes constipation Apple juice relieves constipation Cinnamon is a good spice to add to it. Cinnamon is a good spice to add to it. Peel the skin, de-core the apple and remove the seeds. Cut the required quantity of the apple. • You can steam the apples using Steamer (steaming helps in preserving most of the nutrients). • Take the apple chunks in a bowl, place inside a pressure cooker filled with water, cook them for 4 to 5 whistles (it depends on the type of apple), after the steam is out, remove the bowl. • Take a thick bottomed pan, fill with water, place the bowl with apple, cover and cook till the required consistency is achieved. After cooking the apple either you can mash the cooked apple by spoon or masher or blend it with Blender . Do not add water, add breast milk or formula feed to make it little runny. Transfer the contents to a sterile feeding bowl and serve. It can be given at any time of the day dear. Sometimes it does happens dear. If it persists then do fix an appointment with your paed and check your child. To avoid constipation feed your child 2 sips of water with every spoon of feed. Initially for 6 months old child in a day 1 puree or 2 puree’s should be fed. Once your child gets adjusted with the taste of the food. Then you can change the timing of the food as well as can increase the quantity of the food. 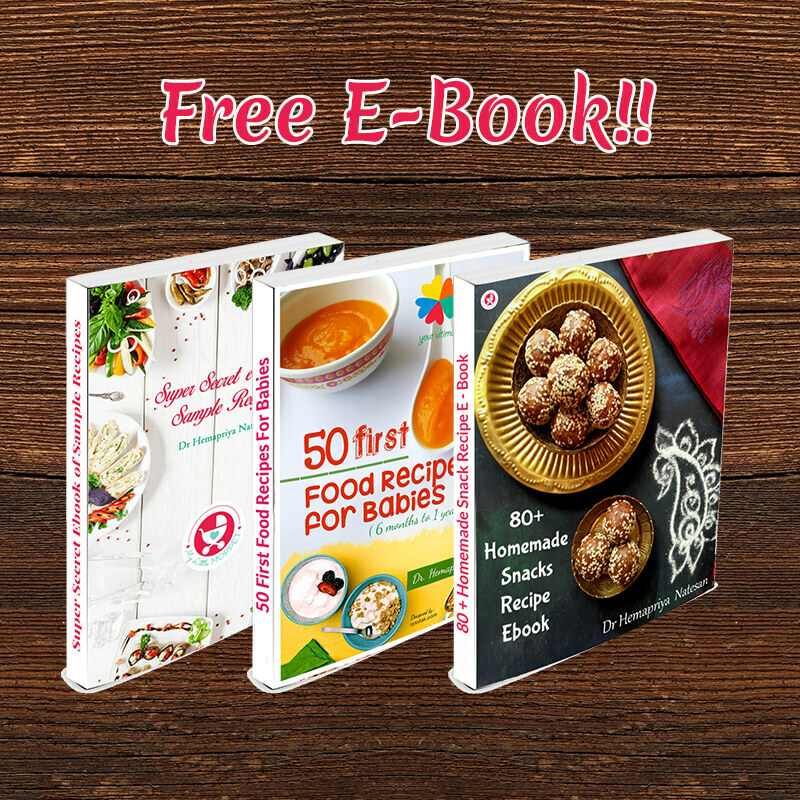 The below given link contains the food chart for a 6 month old baby and also the remedies for constipation. It’s normal for babies to get constipated while taking different new foods. Don’t worry dear. Please find link below with home remedies for constipation. Use according to the baby’s age. My daughter will turn 1 year in a week. I am worried as she is not gaining weight since many days and looks skinny as compared to before. She is otherwise active and playful. Pls. pls. 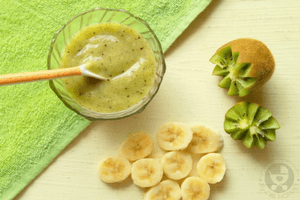 advice some weight gain recipes which will help in gaining weight. Nice that your baby is active and healthy. 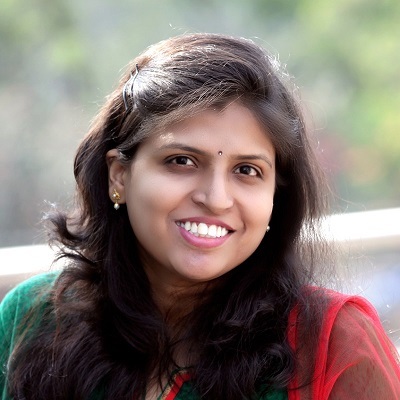 There are many weight gaining foods that you can feed your baby with, like Ghee, Cheese, Dry Fruits, Ragi, Potato, Sweet Potato, Milk, Health mixes, Kerala Banana Powder, Pear, Peas, Avocado, Paneer, Banana, Coconut Oil etc.  You can also use the weight gaining products of little moppet foods. It’s always better to feed fresh. You can freeze the puree to cubes. After freezing you can transfer the cubes into freezer bags and it can be used within a month. It’s better to give fresh. 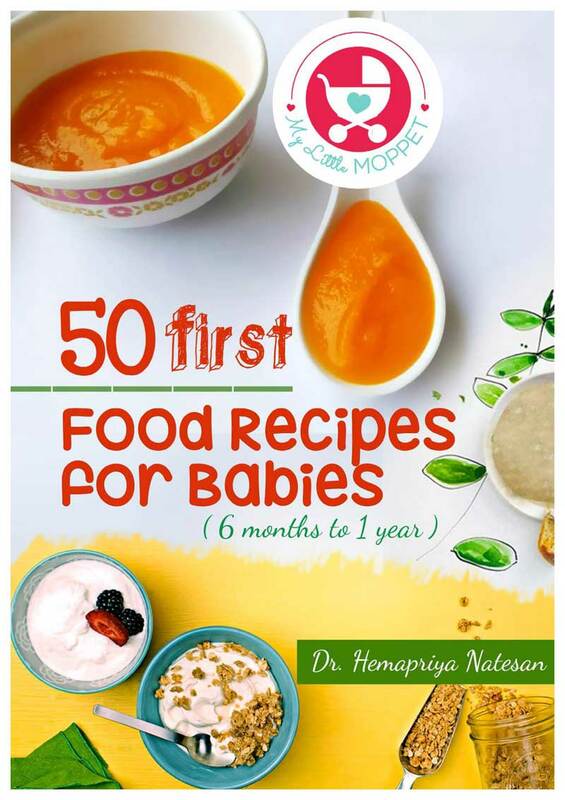 I am starting solids for my 6 months old baby.He is exclusively breastfed but I have never expressed and I have never given him formula so I don’t want to start 2 new things at the same time.Can I mix water in which apples were boiled to make it little runny? Hi Avanti, you can add water or breastmilk to make the purees runny. When do you add cinnamon – before or after steaming? Can you start using spices at 6 months? After steaming is good too. You can avoid that dear . Hello Madam, whether babies can be feed raw apple? My son is 7 months old and he refuses to eat cooked apple. I’m so worried. Priya you can give raw apple. Hi, My baby is 6.5 months old. Can I mix formula milk with steamed apple in blender ? as she does not take enough milk (only 40 ml at a feeding) thats the reason want to give milk in other way.. pl suggest .. Is it safe to blend the formula milk ? Thank u for useful website…. I started apple puree for my 6mnth baby just 4days ,but her chest is khudkhud, i mean she is doing khud khud sound and she is coughing while having formula milk,is this becz of starting apple to her ,i shuld stop giving apple to her? Please try giving homemade cerelac powder, recipe for which is available in the blog. Hello doc, my baby is 9.10 now and he doesn’t like to eat raw fruits, is there a way to feed him? My baby is completed her 5 month.I tried apple puree for 2 days . but it cause cold to her. What to do? I tried feeding apple puree today to my son… he is 2wks past 5 months. He dint seem to like it kept spitting out and vomitting signs… is it ok to give the apple raw…? My kid is 6 months old (He is Breast feeding baby). Please let me know the food Recipes for him for full day, I mean by timings. Is sapota good to feed him? He is getting cough when I give sapota. Should I stop giving? My daughter going to be 6 months old. Started giving Rice porridge, carrot puree, beetroot puree… Planning to give her Apple puree. She normally pass stool once in 3 or 4 days.. Now due to climate change she got cold (running nose)… Is it safe to give Apple puree? My baby is 5 months old .By Next week she will be 6 month old. I have been giving cerelac rice to her as per Dr advice. Today i gave apple puree as mentioned . but she spitted out and gave vomiting signs. I tried three times , each time she shown same sign. i stooped giving. How and when can i give her apple again and in what form . shall i mix it with cerelac. what food can i start again ? 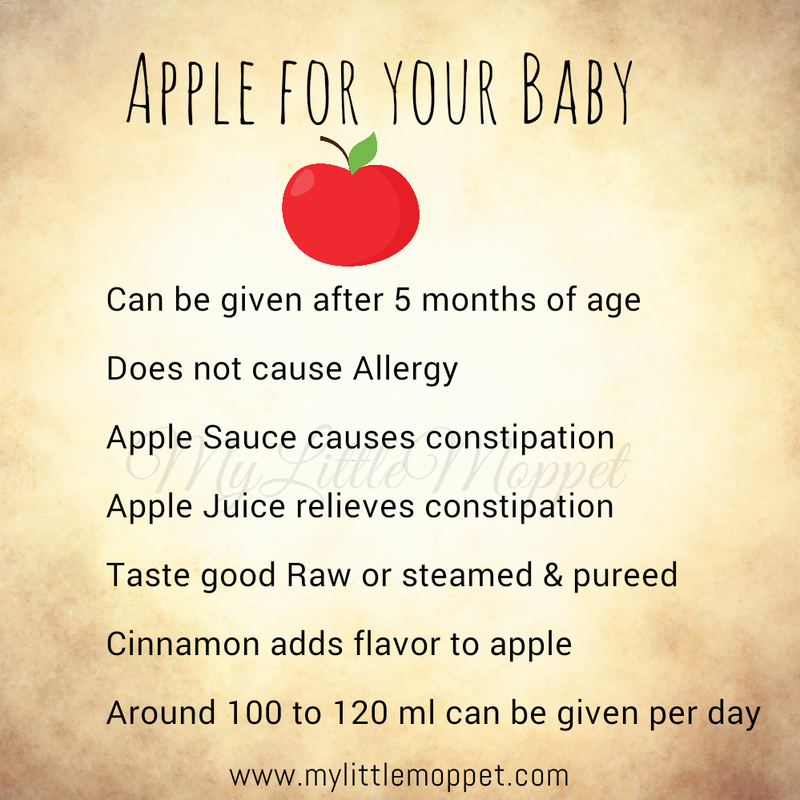 my son is 9 months old.from when can i start giving apple puree without cooking/steaming the apple? As you have mentioned, apple puree led to constipation and juice led to loose stools. How can I give him apple? I made the apple puree as mentioned. My daughter loved it but had very hard stools. As you mentioned it, puree causes constipation. I have stopped giving it to her. Which other fruit can I give her? My Son loved it, his first food, I tried it with cooker 4-5 whistles and was easy to smash with spoon. how to make apple juice for 5 months baby? Whenever I prepared Apple puree, apple cube color become brown or blackish.